by Bill Dwight on Wednesday, May 18, 2011 at 5:43 PM | LEAVE A COMMENT! We’re constantly scouring the Internet looking for articles related to family finances and teaching kids good personal finance habits. You can visit the FamZoo delicious page to see our ever growing list of family finance bookmarks. We’re up to 1,513 now! Each week, we pick our favorite articles from the previous week and post them here. OMG!! Prom spending is outta control! 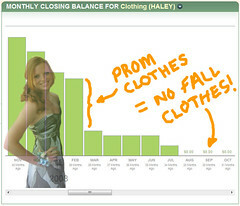 Check out the 2011 prom spending survey from Visa. Surveyed families in the West who send their teens to prom are shelling out over a grand on average. Yow! Families in the South spend almost half that much, but it’s still a whopping $542. See all the stats from the Visa survey here. I’m no kill-joy, but that seems like an awful lot of cash for an evening out. You can see that my own daughter took quite a bite out of her annual clothing budget for prom clothing back when she was in high school (see picture). In her case, that meant forgoing clothing purchases throughout the subsequent Fall. I suspect the lion’s share of prom purchases is for wear-it-once prom dresses. That was the case for my daughter. Which got me to thinking: why not have some sort of prom dress exchange? Wear-it-once becomes wear-it-many with less waste and lower cost. Sure enough. Google “prom dress exchange” and you’ll see lots of options — commercial sites like this one or free grass roots efforts like this one I saw on Facebook. I like how dress exchanges make prom accessible to more kids and shift the emphasis from finances to fun. Enough of excessive spending. Let’s go minimalist instead. I love Trent’s iron pot story as an illustration of how to approach spending in a minimalist, non-impulsive way. It’s a great philosophy to model and share with your kids. Focus on the experience, not the bling. I’m always fascinated by the “science” of incentives — a topic that’s guaranteed to spark emotions and controversy (e.g., the great paying for grades debate). Dan summarizes the results of a recent study that paid kids to eat their vegetables. The bottom line: the good habit persisted even after the bribes stopped. Dan postulates the same approach can be taken with other habits that aren’t particularly appealing but are good for you — like personal finance. In other words, pay kids to practice good earning, saving, spending, investing, and giving habits. Check out Dan’s 5 good habit bribery suggestions here. Most are variations on the matching payment theme. Do you use a matching strategy to encourage good habits in your kids? In keeping with the “paying for stuff theme” this week, let’s wrap things up with a collection of bonus videos about paying for really stupid stuff. Ever bought something super ridiculous? You aren’t alone. How about your own casket (well before you actually kick the bucket)? You can see other absurd spending confessions on the Spendster Reality Check Challenge Contest page. Need to get a spending confession off your chest? Go for it!